Now with newly elected President Hashim Thaçi, the country is highly qualified to be recognised as 'The Nest of Crime Fugitives in ‪European‬ doorstep. Clashes erupted between opposition supporters and police outside Kosovo’s parliament in the capital, Pristina on February 26. Police used tear gas and water cannons to disperse hundreds of opposition supporters camping in tents on the main square demanding the government’s resignation and fresh elections. Police reportedly intervened after Molotov cocktails were thrown at the parliament building. The clashes came as Kosovo’s parliament was set to vote on electing Hashim Thaçi, the current foreign minister and former guerrilla leader, as the next president. Thaçi, who led the fighters of Kosovo’s successful separatist conflict against Yugoslav forces of Serbia in 1998-1999, believed he had the votes in the 120-seat parliament, but the assembly had to repeat three times the voting process since the required votes didn’t match as for the first round he received 50 votes, second round 64 and third round after foreign embassies heavily pressured MPs he reached the political quorum of 71, but it is not that sure yet, since Serbian MPs with a power of veto in the assembly might change their mind and refuse to approve his presidential candidacy, which in this case the assembly either has to change the constitution, which could be the case, or just move yet into another round of presidential vote in the parliament. With revealed NATO files as well as WikiLeaks documents, findings suggest that the government of Kosovo is lead by crime fugitives with names such as the ‘Butchers’, ‘Balkan Mafia Boss’ as well as organ harvesters. Judging from the revelations origin, it seems like the United States and some other Western European powers that support the government of Kosovo, have had extensive knowledge for several years of criminal ties to former rebel leader Hashim Thaci, including the whole structure of political parties in the country, without exception. Foreign political, military, police, and justice powers in Kosovo, have scandalously kept silent for over 17 years, granting crime a lawless and consequence-free paradise. Those findings suggest that the foreigners would continue to turn a blind eye to crime gangs on their doorstep, if there were no insiders to reveal the evidence of their tacit involvement. Opposition is challenging the current rulers, but U.S. Ambassador to Kosovo, who spends more time in the country’s assembly facilities rather then in his office, seemed to be disgusted by the opposition’s actions. In reality there is and will never be any democratic or freedom progress in the country unless there is to be a political class free from corruption; but nevertheless evidence suggests that foreign powers have been all too willing to support corrupt political elites in return for political influence. Some citizens of the country, outraged by the foreign embassies interference in the country’s internal political issues, notably by U. S Ambassador Greg Delawie whose office permanently supported politicians who are officially accused for crime involvement had initiated an online petition to address their concern at the U. S. President Obama’s office in Washington. This democratic act received an imminent threat by the country’s Prime Minister Isa Mustafa charging it as an act of terrorism. Another citizen of Kosovo living abroad appeared to have destroyed his passport of Kosovo after the assembly elected the president. According to Mustafa’s set of standards, this act could probably be an instigation of terrorism, too! Isa Mustafa himself promised the citizens that he would fight the corruption at the very foundations of the country’s government but several months later he was seen to be complicit amongst the many alleged cases, as local media has reported. Well, for his freedom, he seems that he has to pay a very expensive bill, ‘why not’ even charging his citizens with terrorism allegations despite their very peacefully dissatisfactory political expression through an online legal act of a petition to oppose the undemocratic, illegal and interference of a foreign ambassador into their home country policy-making, which would affect badly their day-to-day life. The EU’s attempt to positively influence Kosovo has been significantly weakened (if it hasn’t entirely failed) by the fact that some of its high officials within the EU Rule of Law Mission in Kosovo (EULEX), have been accused of involvement in the very same organized crime and corruption that they have been mandated to combat in joint efforts with local institutions. The newly elected President of Kosovo, Hashim Thaçi, is heavily accused by the European Council of involvement in crime and corruption, including being suspected of having committed war crimes and crimes against humanity, for example alleged “organ harvesting“ during the war against Serb forces in 1999. Another report, identifies him as one of the “biggest fish” in organized crime in his country, according to western military intelligence reports leaked to The Guardian. In June 1997, in an incident that many individuals in the guerrilla movement identified as “sinister”, a Kosovo-Albanian journalist who had close ties with the movement was found dead in Tirana, his face “marred by repeated stabbings with a screwdriver and at the end of buttocks was found a broken bottle” as told by the New York Times. Identified as Ali Uka he was supportive to the rebel movement, but also sufficiently independent to criticize the uprising. At the time of his death, he was living in an apartment with Hashim Thaçi, said The Guardian. 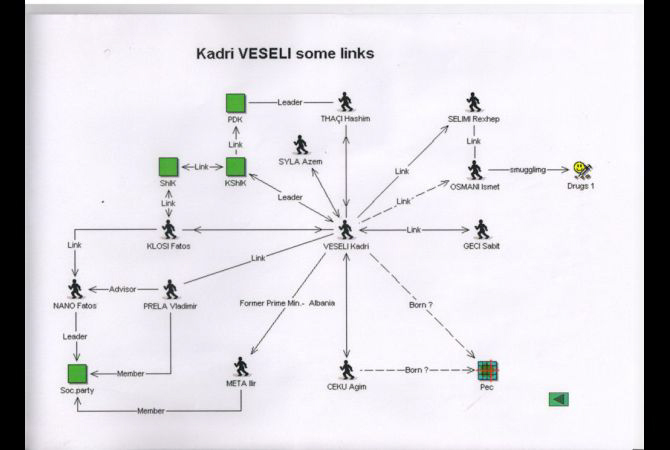 The assembly speaker of the Republic of Kosovo, Kadri Veseli, is among those in charge of the geographical spread of criminal gangs in Kosovo is located along with alleged familial links and business ties, as diplomatic leaked cables and NATO intelligence files suggests. The report identifies him as well connected with opposition political parties such as the AAK of Ramush Haradinaj and the Vetevendosje party, of which Rexhep Selimi is a leading member, as well as several other small groups that act as fronts for crime clans through order of ‘Kanun’; and the list goes on and on with ministers and deputies, police, and local mayors all across the country. Seemingly, the organized crime and corruption, which appears to have been systematically installed and supported by foreign powers and domestic political, justice, police, and military establishments in Kosovo, has now officially accomplished the criteria to truthfully be called as the state of mafia—a country which is the last republic to have emerged from what once was known as Yugoslavia, now a nest of the crime and corruption that has been rotting people’s lives ever since the reported death of the strongman of Belgrade Slobodan Milosevic who was supposed to be tried for alleged crimes and war crimes commitment against humanity across the Balkan peninsula. Kosovo is the poorest and most isolated country in Europe. A third of the workforce is unemployed, and corruption is widespread. Youth unemployment (which includes those aged 25 and under) stands at two in three, and nearly half of the estimated 1.8 million citizens of Kosovo are considered to be in poverty. From December 2014 until February 2015, about five percent of the population was forced to leave the country in an effort to find a better life, studies, and more dignified jobs, by taking the uncertain path towards wealthier countries in the EU. The country has been facing the most serious political crisis since the declaration of independence from Serbia in 2008. In the past five months, the opposition has disrupted the work of Parliament using tear gas and pepper spray, whistles and water bottles, apparently demanding that the government renounce a deal with Serbia giving more powers to ethnic-Serb communities and another with Montenegro on border demarcation. Many members of the opposition in the country are so far being forcedly captured by police while seating in the parliamentary sessions and sent to custody for their alleged roles in the disruptive actions. According to Kosovo’s constitution, parliament must elect a new president by March 6 or announce snap elections. The mandate of the current president, Atifete Jahjaga, is due to expire on April 7.